Quick tip: Avoid eating after dinner. James was always a gangly, skinny kid. In his twenties, though, his weight started to catch up with his height. After college, he took on a full-time career in a financial office, and the hours seated at a desk and in meetings put on the pounds. By the time he got married, his weight was starting to become a problem. “After my son, Ryan, was born, I realized I didn’t want to be a chubby daddy. I had always hoped that I could be a role model for my son, and I definitely did not want to have any health problems that would prevent me from participating fully in his life. My wife, Jennifer, had gone on Weight Watchers after giving birth and had great success. She got her weight down to less than it was before she became pregnant, and she looked terrific. 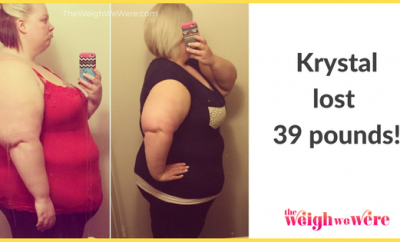 “I knew then that I had no excuse not to lose my own extra pounds. Weight Watchers just didn’t seem like the right path for me, though. I have a hard time cutting out fat and don’t enjoy many of the foods that you’re allowed to eat the most of on that particular plan. 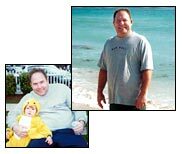 “In winter of 2003 I decided it was time to try the low-carb approach that seemed to be working for so many guys. When I did, I found it was actually very easy for me to follow the basic eating style. For example, I like meat and cheese, so incorporating more of those foods into my diet was no problem. It was harder for me to change bad habits, like drinking glass after glass of full-calorie soda and eating extra meals late in the day. I used to hit the kitchen every night at around 10:00; probably ate close to 1,000 calories and called it a ‘snack.’ Switching to diet soda made a big difference in the number of calories I consume. And I bought a treadmill, so I can take a walk rather than making a midnight snack run.